For other uses, see Syllable (disambiguation). A syllable is a unit of organization for a sequence of speech sounds. It is typically made up of a syllable nucleus (most often a vowel) with optional initial and final margins (typically, consonants). Syllables are often considered the phonological "building blocks" of words. They can influence the rhythm of a language, its prosody, its poetic metre and its stress patterns. Speech can usually be divided up into a whole number of syllables: for example, the word ignite is composed of two syllables: ig and nite. Syllabic writing began several hundred years before the first letters. The earliest recorded syllables are on tablets written around 2800 BC in the Sumerian city of Ur. This shift from pictograms to syllables has been called "the most important advance in the history of writing". A word that consists of a single syllable (like English dog) is called a monosyllable (and is said to be monosyllabic). Similar terms include disyllable (and disyllabic; also bisyllable and bisyllabic) for a word of two syllables; trisyllable (and trisyllabic) for a word of three syllables; and polysyllable (and polysyllabic), which may refer either to a word of more than three syllables or to any word of more than one syllable. Syllable is an Anglo-Norman variation of Old French sillabe, from Latin syllaba, from Koine Greek συλλαβή syllabḗ (Greek pronunciation: [sylːabɛ̌ː]). συλλαβή means "what is taken together", referring to letters that are taken together to make a single sound. συλλαβή is a verbal noun from the verb συλλαμβάνω syllambánō, a compound of the preposition σύν sýn "with" and the verb λαμβάνω lambánō "take". The noun uses the root λαβ-, which appears in the aorist tense; the present tense stem λαμβάν- is formed by adding a nasal infix ⟨μ⟩ ⟨m⟩ before the β b and a suffix -αν -an at the end. In the International Phonetic Alphabet (IPA), the period ⟨.⟩ marks syllable breaks, such as in the word "astronomical" ⟨/ˌæs.trəˈnɒm.ɪk.əl/⟩. In practice, however, IPA transcription is typically divided into words by spaces, and often these spaces are also understood to be syllable breaks. In addition, the stress mark ⟨ˈ⟩ is placed immediately before a stressed syllable, and when the stressed syllable is in the middle of a word, the stress mark also marks a syllable break, for example in the word "understood" ⟨/ʌndərˈstʊd/⟩. When a word space comes in the middle of a syllable (that is, when a syllable spans words), a tie bar ⟨‿⟩ can be used for liaison, as in the French combination les amis ⟨/le.z‿a.mi/⟩. The liaison tie is also used to join lexical words into phonological words, for example hot dog ⟨/ˈhɒt‿dɒɡ/⟩. The syllable is usually considered right-branching, i.e. nucleus and coda are grouped together as a "rime" and are only distinguished at the second level. The nucleus is usually the vowel in the middle of a syllable. The onset is the sound or sounds occurring before the nucleus, and the coda (literally 'tail') is the sound or sounds that follow the nucleus. They are sometimes collectively known as the shell. The term rime covers the nucleus plus coda. In the one-syllable English word cat, the nucleus is a (the sound that can be shouted or sung on its own), the onset c, the coda t, and the rime at. This syllable can be abstracted as a consonant-vowel-consonant syllable, abbreviated CVC. Languages vary greatly in the restrictions on the sounds making up the onset, nucleus and coda of a syllable, according to what is termed a language's phonotactics. Although every syllable has supra-segmental features, these are usually ignored if not semantically relevant, e.g. in tonal languages. In many languages of the Mainland Southeast Asia linguistic area, such as Chinese, the syllable structure is expanded to include an additional, optional segment known as a medial, which is located between the onset (often termed the initial in this context) and the rime. The medial is normally a semivowel, but reconstructions of Old Chinese generally include liquid medials (/r/ in modern reconstructions, /l/ in older versions), and many reconstructions of Middle Chinese include a medial contrast between /i/ and /j/, where the /i/ functions phonologically as a glide rather than as part of the nucleus. In addition, many reconstructions of both Old and Middle Chinese include complex medials such as /rj/, /ji/, /jw/ and /jwi/. The medial groups phonologically with the rime rather than the onset, and the combination of medial and rime is collectively known as the final. Some linguists, especially when discussing the modern Chinese varieties, use the terms "final" and "rime/rhyme" interchangeably. In historical Chinese phonology, however, the distinction between "final" (including the medial) and "rime" (not including the medial) is important in understanding the rime dictionaries and rime tables that form the primary sources for Middle Chinese, and as a result most authors distinguish the two according to the above definition. 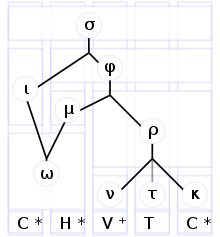 In some theories of phonology, syllable structures are displayed as tree diagrams (similar to the trees found in some types of syntax). Not all phonologists agree that syllables have internal structure; in fact, some phonologists doubt the existence of the syllable as a theoretical entity. In some traditional descriptions of certain languages such as Cree and Ojibwe, the syllable is considered left-branching, i.e. onset and nucleus group below a higher-level unit, called a "body" or "core". This contrasts with the coda. The rime or rhyme of a syllable consists of a nucleus and an optional coda. It is the part of the syllable used in most poetic rhymes, and the part that is lengthened or stressed when a person elongates or stresses a word in speech. The rime is usually the portion of a syllable from the first vowel to the end. For example, /æt/ is the rime of all of the words at, sat, and flat. However, the nucleus does not necessarily need to be a vowel in some languages. For instance, the rime of the second syllables of the words bottle and fiddle is just /l/, a liquid consonant. Just as the rime branches into the nucleus and coda, the nucleus and coda may each branch into multiple phonemes. The limit for the number of phonemes which may be contained in each varies by language. For example, Japanese and most Sino-Tibetan languages do not have consonant clusters at the beginning or end of syllables, whereas many Eastern European languages can have more than two consonants at the beginning or end of the syllable. In English, the onset, nucleus, and coda may all have two phonemes, as in the word flouts: [fl] in the onset, the diphthong [aʊ] in the nucleus, and [ts] in the coda. Rime and rhyme are variants of the same word, but the rarer form rime is sometimes used to mean specifically syllable rime to differentiate it from the concept of poetic rhyme. This distinction is not made by some linguists and does not appear in most dictionaries. C = consonant, V = vowel, optional components are in parentheses. A heavy syllable is generally one with a branching rime, i.e. it is either a closed syllable that ends in a consonant, or a syllable with a branching nucleus, i.e. a long vowel or diphthong. The name is a metaphor, based on the nucleus or coda having lines that branch in a tree diagram. In some languages, heavy syllables include both VV (branching nucleus) and VC (branching rime) syllables, contrasted with V, which is a light syllable. In other languages, only VV syllables are considered heavy, while both VC and V syllables are light. Some languages distinguish a third type of superheavy syllable, which consists of VVC syllables (with both a branching nucleus and rime) or VCC syllables (with a coda consisting of two or more consonants) or both. In moraic theory, heavy syllables are said to have two moras, while light syllables are said to have one and superheavy syllables are said to have three. Japanese phonology is generally described this way. Many languages forbid superheavy syllables, while a significant number forbid any heavy syllable. Some languages strive for constant syllable weight; for example, in stressed, non-final syllables in Italian, short vowels co-occur with closed syllables while long vowels co-occur with open syllables, so that all such syllables are heavy (not light or superheavy). The difference between heavy and light frequently determines which syllables receive stress – this is the case in Latin and Arabic, for example. The system of poetic meter in many classical languages, such as Classical Greek, Classical Latin, Old Tamil and Sanskrit, is based on syllable weight rather than stress (so-called quantitative rhythm or quantitative meter). Syllabification is the separation of a word into syllables, whether spoken or written. In most languages, the actually spoken syllables are the basis of syllabification in writing too. Due to the very weak correspondence between sounds and letters in the spelling of modern English, for example, written syllabification in English has to be based mostly on etymological i.e. morphological instead of phonetic principles. English "written" syllables therefore do not correspond to the actually spoken syllables of the living language. Phonotactic rules determine which sounds are allowed or disallowed in each part of the syllable. English allows very complicated syllables; syllables may begin with up to three consonants (as in string or splash), and occasionally end with as many as four (as in prompts). Many other languages are much more restricted; Japanese, for example, only allows /ɴ/ and a chroneme in a coda, and theoretically has no consonant clusters at all, as the onset is composed of at most one consonant. There can be disagreement about the location of some divisions between syllables in spoken language. The problems of dealing with such cases have been most commonly discussed with relation to English. In the case of a word such as "hurry", the division may be /hʌr.i/ or /hʌ.ri/, neither of which seems a satisfactory analysis for a non-rhotic accent such as RP (British English): /hʌr.i/ results in a syllable-final /r/, which is not normally found, while /hʌ.ri/ gives a syllable-final short stressed vowel, which is also non-occurring. Arguments can be made in favour of one solution or the other: Wells (2002) proposes a general rule that "Subject to certain conditions ..., consonants are syllabified with the more strongly stressed of two flanking syllables", while many other phonologists prefer to divide syllables with the consonant or consonants attached to the following syllable wherever possible. However, an alternative that has received some support is to treat an intervocalic consonant as ambisyllabic, i.e. belonging both to the preceding and to the following syllable: /hʌṛi/. This is discussed in more detail in English phonology § Phonotactics. The onset (also known as anlaut) is the consonant sound or sounds at the beginning of a syllable, occurring before the nucleus. Most syllables have an onset. Syllables without an onset may be said to have a zero onset – that is, nothing where the onset would be. Some languages restrict onsets to be only a single consonant, while others allow multiconsonant onsets according to various rules. For example, in English, onsets such as pr-, pl- and tr- are possible but tl- is not, and sk- is possible but ks- is not. In Greek, however, both ks- and tl- are possible onsets, while contrarily in Classical Arabic no multiconsonant onsets are allowed at all. Some languages forbid null onsets. In these languages, words beginning in a vowel, like the English word at, are impossible. This is less strange than it may appear at first, as most such languages allow syllables to begin with a phonemic glottal stop (the sound in the middle of English "uh-oh" or, in some dialects, the double T in "button", represented in the IPA as /ʔ/). In English, a word that begins with a vowel may be pronounced with an epenthetic glottal stop when following a pause, though the glottal stop may not be a phoneme in the language. Few languages make a phonemic distinction between a word beginning with a vowel and a word beginning with a glottal stop followed by a vowel, since the distinction will generally only be audible following another word. However, Maltese and some Polynesian languages do make such a distinction, as in Hawaiian /ahi/ "fire" and /ʔahi/ "tuna". Hebrew and Arabic forbid empty onsets. The names Israel, Abel, Abraham, Iran, Omar, Abdullah, and Iraq appear not to have onsets in the first syllable, but in the original Hebrew and Arabic forms they actually begin with various consonants: the semivowel /j/ in yisrāʔēl, the glottal fricative in /h/ heḅel, the glottal stop /ʔ/ in ʔaḅrāhām and ʔīrān, or the pharyngeal fricative /ʕ/ in ʕumar, ʕabduḷḷāh, and ʕirāq. Conversely, the Arrernte language of central Australia may prohibit onsets altogether; if so, all syllables have the underlying shape VC(C). The difference between a syllable with a null onset and one beginning with a glottal stop is often purely a difference of phonological analysis, rather than the actual pronunciation of the syllable. In some cases, the pronunciation of a (putatively) vowel-initial word when following another word – particularly, whether or not a glottal stop is inserted – indicates whether the word should be considered to have a null onset. For example, many Romance languages such as Spanish never insert such a glottal stop, while English does so only some of the time, depending on factors such as conversation speed; in both cases, this suggests that the words in question are truly vowel-initial. But there are exceptions here, too. For example, standard German (excluding many southern accents) and Arabic both require that a glottal stop be inserted between a word and a following, putatively vowel-initial word. Yet such words are said to begin with a vowel in German but a glottal stop in Arabic. The reason for this has to do with other properties of the two languages. For example, a glottal stop does not occur in other situations in German, e.g. before a consonant or at the end of word. On the other hand, in Arabic, not only does a glottal stop occur in such situations (e.g. Classical /saʔala/ "he asked", /raʔj/ "opinion", /dˤawʔ/ "light"), but it occurs in alternations that are clearly indicative of its phonemic status (cf. Classical /kaːtib/ "writer" vs. /maktuːb/ "written", /ʔaːkil/ "eater" vs. /maʔkuːl/ "eaten"). The writing system of a language may not correspond with the phonological analysis of the language in terms of its handling of (potentially) null onsets. For example, in some languages written in the Latin alphabet, an initial glottal stop is left unwritten;[example needed] on the other hand, some languages written using non-Latin alphabets such as abjads and abugidas have a special zero consonant to represent a null onset. As an example, in Hangul, the alphabet of the Korean language, a null onset is represented with ㅇ at the left or top section of a grapheme, as in 역 "station", pronounced yeok, where the diphthong yeo is the nucleus and k is the coda. The nucleus is usually the vowel in the middle of a syllable. Generally, every syllable requires a nucleus (sometimes called the peak), and the minimal syllable consists only of a nucleus, as in the English words "eye" or "owe". The syllable nucleus is usually a vowel, in the form of a monophthong, diphthong, or triphthong, but sometimes is a syllabic consonant. In most Germanic languages, lax vowels can occur only in closed syllables. Therefore, these vowels are also called checked vowels, as opposed to the tense vowels that are called free vowels because they can occur even in open syllables. The notion of syllable is challenged by languages that allow long strings of obstruents without any intervening vowel or sonorant. By far the most common syllabic consonants are sonorants like [l], [r], [m], [n] or [ŋ], as in English bottle, church (in rhotic accents), rhythm, button and lock 'n key. However, English allows syllabic obstruents in a few para-verbal onomatopoeic utterances such as shh (used to command silence) and psst (used to attract attention). All of these have been analyzed as phonemically syllabic. Obstruent-only syllables also occur phonetically in some prosodic situations when unstressed vowels elide between obstruents, as in potato [pʰˈteɪɾəʊ] and today [tʰˈdeɪ], which do not change in their number of syllables despite losing a syllabic nucleus. A few languages have so-called syllabic fricatives, also known as fricative vowels, at the phonemic level. (In the context of Chinese phonology, the related but non-synonymous term apical vowel is commonly used.) Mandarin Chinese is famous for having such sounds in at least some of its dialects, for example the pinyin syllables sī shī rī, sometimes pronounced [sź̩ ʂʐ̩́ ʐʐ̩́] respectively. Though, like the nucleus of rhotic English church, there is debate over whether these nuclei are consonants or vowels. Languages of the northwest coast of North America, including Salishan, Wakashan and Chinookan languages, allow stop consonants and voiceless fricatives as syllables at the phonemic level, in even the most careful enunciation. An example is Chinook [ɬtʰpʰt͡ʃʰkʰtʰ] 'those two women are coming this way out of the water'. Linguists have analyzed this situation in various ways, some arguing that such syllables have no nucleus at all and some arguing that the concept of "syllable" cannot clearly be applied at all to these languages. In Bagemihl's survey of previous analyses, he finds that the Bella Coola word /t͡sʼktskʷt͡sʼ/ 'he arrived' would have been parsed into 0, 2, 3, 5, or 6 syllables depending on which analysis is used. One analysis would consider all vowel and consonant segments as syllable nuclei, another would consider only a small subset (fricatives or sibilants) as nuclei candidates, and another would simply deny the existence of syllables completely. However, when working with recordings rather than transcriptions, the syllables can be obvious in such languages, and native speakers have strong intuitions as to what the syllables are. This type of phenomenon has also been reported in Berber languages (such as Indlawn Tashlhiyt Berber), Moroccan Arabic (apparently under Berber influence), Mon–Khmer languages (such as Semai, Temiar, Khmu) and the Ōgami dialect of Miyako, a Ryukyuan language. The coda (also known as auslaut) comprises the consonant sounds of a syllable that follow the nucleus. The sequence of nucleus and coda is called a rime. Some syllables consist of only a nucleus, only an onset and a nucleus with no coda, or only a nucleus and coda with no onset. The phonotactics of many languages forbid syllable codas. Examples are Swahili and Hawaiian. In others, codas are restricted to a small subset of the consonants that appear in onset position. At a phonemic level in Japanese, for example, a coda may only be a nasal (homorganic with any following consonant) or, in the middle of a word, gemination of the following consonant. (On a phonetic level, other codas occur due to elision of /i/ and /u/.) In other languages, nearly any consonant allowed as an onset is also allowed in the coda, even clusters of consonants. In English, for example, all onset consonants except /h/ are allowed as syllable codas. If the coda consists of a consonant cluster, the sonority decreases from left to right, as in the English word help. This is called the sonority profile. English onset and coda clusters are therefore different. The onset str in strengths does not appear as a coda in any English word, and likewise the coda ngths does not appear as an onset in any word. "Checked syllable" redirects here. For checked syllables in Chinese, see Checked tone. A coda-less syllable of the form V, CV, CCV, etc. (V = vowel, C = consonant) is called an open syllable or free syllable, while a syllable that has a coda (VC, CVC, CVCC, etc.) is called a closed syllable or checked syllable. Note that they have nothing to do with open and close vowels, but are defined according to the phoneme that ends the syllable: a vowel (open syllable) or a consonant (closed syllable). Almost all languages allow open syllables, but some, such as Hawaiian, do not have closed syllables. Note that when a syllable is not the last syllable in a word, the nucleus normally must be followed by two consonants in order for the syllable to be closed. This is because a single following consonant is typically considered the onset of the following syllable. For example, Spanish casar "to marry" is composed of an open syllable followed by a closed syllable (ca-sar), whereas cansar "to get tired" is composed of two closed syllables (can-sar). When a geminate (double) consonant occurs, the syllable boundary occurs in the middle, e.g. Italian panna "cream" (pan-na); cf. Italian pane "bread" (pa-ne). A list of examples of syllable codas in English is found at English phonology: Coda. Some languages, such as Hawaiian, forbid codas, so that all syllables are open. Sometimes syllable length is also counted as a suprasegmental feature; for example, in some Germanic languages, long vowels may only exist with short consonants and vice versa. However, syllables can be analyzed as compositions of long and short phonemes, as in Finnish and Japanese, where consonant gemination and vowel length are independent. In most languages, the pitch or pitch contour in which a syllable is pronounced conveys shades of meaning such as emphasis or surprise, or distinguishes a statement from a question. In tonal languages, however, the pitch affects the basic lexical meaning (e.g. "cat" vs. "dog") or grammatical meaning (e.g. past vs. present). In some languages, only the pitch itself (e.g. high vs. low) has this effect, while in others, especially East Asian languages such as Chinese, Thai or Vietnamese, the shape or contour (e.g. level vs. rising vs. falling) also needs to be distinguished. In each case the syllable is considered to have two morae. The first syllable of a word is the initial syllable and the last syllable is the final syllable. In languages accented on one of the last three syllables, the last syllable is called the ultima, the next-to-last is called the penult, and the third syllable from the end is called the antepenult. These terms come from Latin ultima "last", paenultima "almost last", and antepaenultima "before almost last". In Ancient Greek, there are three accent marks (acute, circumflex, and grave), and terms were used to describe words based on the position and type of accent. Some of these terms are used in the description of other languages. And uninterruptedly: in one breath. English phonology#Phonotactics. Covers syllable structure in English. ^ de Jong, Kenneth (2003). "Temporal constraints and characterising syllable structuring". In Local, John; Ogden, Richard; Temple, Rosalind (eds.). Phonetic Interpretation: Papers in Laboratory Phonology VI. Cambridge University Press. pp. 253–268. doi:10.1017/CBO9780511486425.015. ISBN 978-0-521-82402-6. Page 254. ^ Harper, Douglas. "syllable". Online Etymology Dictionary. Retrieved 2015-01-05. ^ See CUNY Conference on the Syllable for discussion of the theoretical existence of the syllable. ^ Feng, Shengli (2003). A Prosodic Grammar of Chinese. University of Kansas. p. 3. ^ Shibatani, Masayoshi (1987). "Japanese". In Bernard Comrie (ed.). The World's Major Languages. Oxford University Press. pp. 855–80. ISBN 0-19-520521-9. ^ "Wells: Syllabification and allophony". Phon.ucl.ac.uk. Retrieved 2016-07-17. ^ Breen, Gavan; Pensalfini, Rob (1999). "Arrernte: A Language with No Syllable Onsets". Linguistic Inquiry. 30 (1): 1–25. JSTOR 4179048. ^ Thomas Pellard. "Ogami (Miyako Ryukyuan)" (PDF). Halshs.archives-ouvertes.fr. Retrieved 2016-07-17. ^ Jonathan Harrington and Felicity Cox (2009-08-01). "The Syllable and Phonotactic Constraints". Clas.mq.edu.au. Retrieved 2016-07-17. Dell, François; Elmedlaoui, Mohamed (1985). "Syllabic consonants and syllabification in Imdlawn Tashlhiyt Berber". Journal of African Languages and Linguistics. 7 (2): 105–130. doi:10.1515/jall.1985.7.2.105. Dell, François; Elmedlaoui, Mohamed (1988). "Syllabic consonants in Berber: Some new evidence". Journal of African Languages and Linguistics. 10: 1–17. doi:10.1515/jall.1988.10.1.1. Syllable Dictionary: Look up the # of syllables in a word. Learn to divide into syllables. Hear it pronounced.